died Wednesday, Feb. 3, 1999, in a San Angelo hospital. Service will be at 11 a.m. Saturday at Tuscola First Baptist Church with the Revs Burtis Williams and Steven Parker officiating. Burial in Tuscola Cemetery, directed by Fry-Bartlett Funeral Home. She was born in Caney, Kan., and was a longtime resident of Tuscola. After graduating from Meeks School of Nursing, she worked at Hendrick Hospital as a licensed vocational nurse. 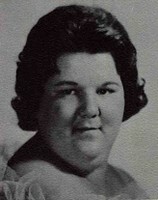 She moved to San Angelo in 1979 and earned a nursing degree from Angelo State University in 1981. She worked as a registred nurse at both Shannon Medical Center and Coommunity Hospital in San Angelo. She married Rob Strakos in 1982 in San Angelo. She retired from Pecos County Hospital in 1998. She was a member of Belmore Baptist Church in San Angelo. and a brother, Dayne Gossett of Abilene. Visitation will be 6-8 p.m. today in the funeral home.